Comedy short The Handyman is heading to film festivals this year starting with the Reelout Queer Film + Video Festival in Kingston, Ontario next month. Written by Nicholas Downs (Is It Just Me?) 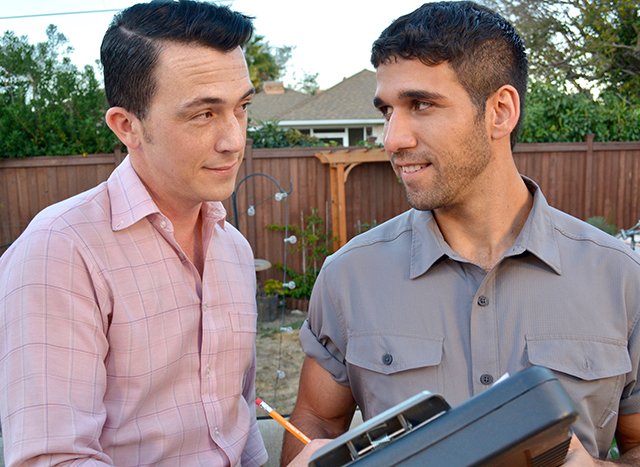 who produces along with director JC Calciano (The 10 Year Plan, Steam Room Stories), The Handyman is about a single, gay man who schemes creative ways to have a hunky repairman continue to have to come back to his house to fix things, but suddenly the fantasies become more than either of them expected. The short stars Downs alongside Derek Ocampo (Steam Room Stories, Where the Bears Are). If you’re interested in arranging a screening of The Handyman for a festival or event contact thehandymanshort@gmail.com. The distribution rights for The Handyman have been acquired by Dekkoo and their film releasing division, Dekkoo Films. For all the latest information and screenings, visit www.facebook.com/thehandymanshortfilm.